As I’ve previously summarised, there are many reasons why such testimonial statements are considered the weakest form of evidence in answering questions about whether ecigs are serious new entrants in the population-wide game of helping smokers to quit. The obvious problems with individual testimonies are self-selection bias (people with a success story are far more likely to want to enthusiastically proselytise their story than the many who try and fail); lead time bias or “borrowing from the future” (some people who quit would have quit weeks or months later anyway, perhaps on their own or using another approach, thus artificially inflating the apparent importance of the method they used when they quit); and relapse. Relapse is a major, much studied sequalae to quit attempts. 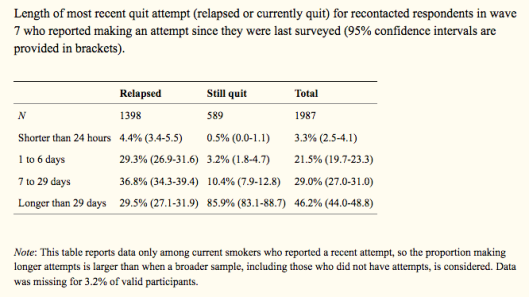 Far more smokers relapse than quit permanently. Across all methods, relapse dominates, with the maximum rates occurring in the first month after an attempt (eg: see table below). This means that cross-sectional (“snap-shot”) surveys which report findings on what people’s smoking status is on the day they answered the survey questions have major limitations. Many people have inaccurate recall of their smoking and quit attempt histories and many people who report being ex-smokers on the day they answered the question would answer that they had returned to smoking if asked the same question a few weeks or months later. For example, this study proposed that by 2014, 6.1m Europeans had quit smoking by vaping. But such “big” numbers often do not withstand scrutiny. The 6.1 million number comes from a cross-sectional survey where ex-smokers reported they used to smoke, then used e-cigarettes and now don’t smoke. Were it only that simple. This critique makes the key point that the survey questions would have allowed those who quit for only a short period to say they had stopped, when relapse is a major phenomenon and demands a longer-term view. Well conducted randomised controlled trials are considered high quality evidence, but have major problems that make them difficult to generalise to “real world” settings. If you volunteer to participate in a trial, you are likely to have a disposition to want to help science and so will probably be very positive and diligent about following the study protocol – unlike the way many in real world conditions forget to take their drugs or relapse. Trial participants are regularly contacted by study organisers trained in cohort retention strategies. This regular contact can result in trialists wanting to please “the lovely research assistant who calls me up each week” and can artificially increase study group retention rates, again unlike real world use where no such influences occur. And if you are heavily dependent on nicotine, enrolled in an RCT and allocated to a study arm with placebo nicotine, guess what? Your withdrawal symptoms will quickly let you know that you are not getting any nicotine, so your belief that the nicotine replacement (NRT or ecigs) you hope you are using might do the trick will instantly be in tatters, with undermining consequences for your quit attempt. For all these (and several other) reasons, the most important forms of evidence about how people quit smoking are longitudinal cohort studies which use high quality participant selection protocols to best ensure that those being interviewed are a representative sample of the smoking population. With smoking cessation, the endemic problem of high relapse back to smoking makes it vital that we take a helicopter view across time of how long transitions in and out of smoking last, long term and permanent quitting, being the ultimate outcome of interest. The large body of evidence we have about relapse heavily underlines that “persistent abstinence” is of far more importance than a former smoker’s smoking status on a particular day, which can change quickly. In 2018, two particularly important papers were published by US researchers using the longitudinal PATH ( Population Assessment of Tobacco and Health) data set. Let’s take a close look at what they found. This important report on transitions in the vaping and smoking status of a nationally representative cohort of American adults aged 18+ who use electronic cigarettes (EC) provides rich data that greatly advances our understanding of the natural history of EC use. If we examine the report’s data and consider the net impact of vaping on the critical goals of having vapers stopping smoking and vaping non-smokers not starting to smoke, the findings are very sobering and should give strong reason for pause among those advocating e-cigarettes as a game-changing way of stopping smoking. The study reported on transitions between participants’ responses at Wave 1 and Wave 2, obtained 12 months later. At Wave 2, of the cohort of 2036 dual users (EC + smoking) only 104 (5.1%) had transitioned to exclusively using ECs and another 143 (7%) had quit both EC and smoking for a combined total of 247 (12.1%) who had persistently quit smoking. Of the 896 exclusive EC users at Wave 1, 277 (30.9%) had stopped vaping at Wave 2. 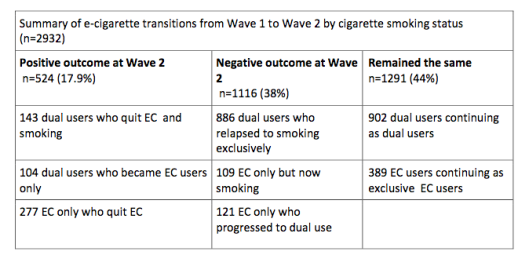 So together, 524 out of the 2932 EC users (17.9%) followed from Wave 1 might be considered to have had positive outcomes at Wave 2 (ie: quitting smoking and/or quitting EC). The other side of the coin however, shows that of the 2036 dual users at Wave 1, 886 (43.5%) relapsed to using cigarettes exclusively. In addition, among the 896 exclusive ECusers from Wave 1, 109 (12.2%) had stopped vaping and were now smoking, with another 121 having resumed smoking as well as using EC (i.e. became dual users). Importantly, 502 of 896 (56%) exclusive e-cigarette users were those who had never been established smokers prior to using e-cigarettes. Alarmingly, of these 502 adults, 120 (23.9%) progressed from using only e-cigarettes to either dual use (54 or 10.8%) or smoking only (66 or 13.2%). The table below shows that for every person vaping at Wave 1 who benefited across 12 months by quitting smoking, there were 2.1 who either relapsed to or took up smoking. Most disturbingly, in this adult cohort nearly one in four of those who had never been established smokers took up smoking after first using EC. Concern about putative gateway effects of ECs to smoking have been dominated by concerns about youth. These data showing transitions from EC to smoking in nearly a quarter of exclusive adult EC users with no histories of established smoking should widen this debate to consider adult gateway effects too. By far the largest proportion of those with negative outcomes are those dual users who relapsed to smoking (886 or 43.5% of dual users). As the authors noted in their discussion, many of these were infrequent EC users, possibly involved in transitory experimentation at Wave 1. If we add the 902 who were still dual using at Wave 2, then 1788 of 2036 dual users (87.8%) in this sample might be said to have been held in smoking (dual using or exclusive smoking) 12 months later compared to 12.1% dual users who may have benefited by using ECs. Commercial interests in both the tobacco and EC industries would be more than delighted with these findings. However, from public health harm reduction perspective these results argue against EC being a revolutionary effective harm reduction strategy, and point to their far stronger potential to both recruit smokers and hold many smokers in smoking. In a second paper using the PATH data, the authors considered persistent abstinence (not using tobacco for more than 30 days). 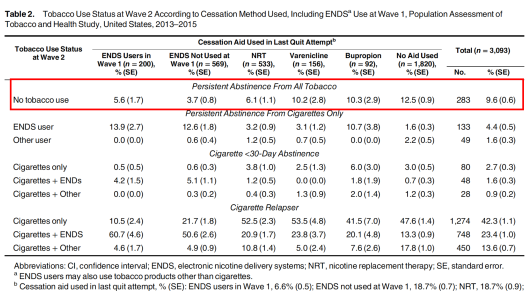 The red highlighted section of the table below shows that those smokers who used ecigs (called ENDS in the table) had the worst persistent abstinence all-tobacco quit rates of any group in the cohort (5.6% of those who were vaping at the Wave 1 survey and 3.7% of those who too up vaping between Wave 1 and Wave 2). By far the most successful all-tobacco quit rate was for “no aid used” (ie cold turkey or unassisted cessation) with 12.5%. When we multiply these quit rates by the numbers of smokers using each quit method, the yield of persistent quitters is even starker (see the second table below derived from the data in the table immediately below). So in this major national cohort of US smokers, not only did EC use produce the lowest rate of persistent abstinence from tobacco use after one year compared to all other quit methods, but EC’s contribution to population-wide tobacco abstinence was utterly dwarfed by all other methods (10.9% v 89.1%). The much-denigrated and neglected unassisted cessation approach quietly ploughed on, continuing its massive historical dominance of how most ex-smokers quit, contributing 1.5 times more quitters than all other methods combined. Why are tobacco companies’ profits still booming – despite government regulation and declining smoking rates? Smoking kills. So if you’re in an industry where your product is known to be damaging the health of people who buy it, then you should, in theory, go out of business. But shares in companies listed in the Bloomberg tobacco producers index have risen 351 percent since 2009, making it one of the best investments of the past decade. Graphic warning labels and taxes seem to have some effect on reducing the number of smokers but less so on industry profits which keep rising. And investors can’t quit buying the stocks because operating profits continue to go up. Although some pension funds and life insurers have turned their back on the sector, it’s still not enough to hit big tobacco where it hurts. Different tax regimes around the world mostly account for the difference in price of cigarettes. But governments are not as hooked as the consumers who buy cigarettes. Consumers cough up for higher prices because they crave the drug in tobacco – nicotine. Without nicotine addiction, there would be no tobacco industry. The tobacco industry knows this and has diversified to develop other nicotine products like E-cigarettes. The electronic cigarette market has grown from just $50m in 2005 to an estimated $7.5bn last year, according to Euromonitor. It’s all part of the unique economy of addiction. New evidence suggests the dangers of cigarettes in the United States have increased despite the fall of smoking rates in recent years. A new study has found that so-called “light” cigarettes may be behind a spike in lung cancer cases, as Heidi Zhou-Castro reports. Jeremias Paul from the World Health Organization joins Counting the Cost from Geneva to discuss the unique dynamics of the nicotine economy. Paul thinks the tobacco industry should pay more taxes because they’re making a profit out of people’s addiction. Seeing someone use an e-cigarette encourages smokers to light up, a study has warned. Even though they don’t look like a normal cigarette, ‘vape pens’ can trigger the same cravings as real tobacco products. A study by Chicago University found the devices were a ‘potent trigger’ to encourage young adults to smoke as they mimic the same behaviour – inhaling and exhaling – and use the same hand and mouth movements as regular cigarettes. The findings cast doubt on how well the smoking ban has worked to put cigarettes ‘out of sight’, as vaping becomes common. Although the 18 to 35-year-olds in the study who were influenced by e-cigarettes already smoked, the findings also raise concerns about a ‘gateway effect’ encouraging people who smoke to vape as well. The study, published in journal Nicotine & Tobacco Research, used 108 volunteers ranging from light smokers to those who went through a pack of cigarettes a day. When they saw someone use a vape pen, they were more likely to want a cigarette or reach for one. Vape pens look more like pens than cigarettes but still deliver a nicotine hit and puff out vapour. Research leader Dr Andrea King, director of the clinical addictions research laboratory at Chicago University, said, “Vape pens look different but they share too many salient features of the act of smoking – including inhalation, exhalation and hand-to-mouth behaviours. This makes them a potent trigger, encouraging people to smoke. The decade-old UK ban on smoking in public places was designed to make the habit seem less normal by keeping smokers out of offices and pubs. However, despite calls from the World Health Organisation for countries to consider a similar ban on e-cigarettes, they are becoming increasingly popular. To measure their effect on susceptible young adults, the researchers planted a pretend volunteer among their study group who smoked either a conventional cigarette or a vape pen. Both cues increased the desire among research subjects for a cigarette or an e-cigarette. Then 26 of the group were tested 20 minutes later by placing a cigarette on a tray, along with a lighter and an ash tray. Told they would receive a cash reward of 20 cents for every five minutes they resisted, those who had seen the person smoking a cigarette or vape pen managed to hold out for only 20 minutes. While a new “vaper” isn’t exposed to the other substances of tar and tobacco such as are found in a normal cigarette, he or she is getting concentrated and more potent doses of nicotine. That’s not good. And we’re seeing younger and younger people trying these. Also not good. The e-cig “e-liquid,” which is what produces the vapor that users inhale and exhale, are marketed in an array of flavors that appeal to younger users — junior high and high school age kids — they’re available for order online, and you’re getting addicted right away to the habit of using nicotine. The flavors available boggle the imagination: bubble gum, banana, “Mother’s MIlk,” blueberry-lemon, banana cinnamon nutbread, pomegranate, strawberry — it goes on endlessly. These teenagers — and even younger children — are getting addicted early, which could lead to smoking, and e-cigs can easily become a gateway to trying and developing an addiction to more serious drugs. Addiction correlates to crime. People need to feed their habit, they break into homes to steal things to resell, they commit robberies on the streets, all to get money to feed their addiction. Ultimately they make some very poor choices and place themselves in very dangerous situations. If you’re trying to quit smoking, remember the key drug, nicotine, is still very much available through an e-cig and at much higher, concentrated doses. So while you will be eliminating the tar and tobacco of a cigarette, you’re amping up the accessibility of nicotine. That’s not exactly a great way to wean yourself from something harmful — to add more of it to your system. We’re seeing a lot more nicotine toxicity. For example, little babies we see in the emergency room — sometimes they get a hold of a cigarette and they chew on it, which is usually not that harmful. But if they get a hold of an e-cigarette and ingest some of that liquid nicotine, which again is so concentrated in an e-cig form, we see nausea, vomiting seizures, paralysis — bad things. Being that the nicotine is one of the most addictive substances, it’s not really helping you quit your addiction, it’s not the path to accomplishing that. And we’re seeing younger and younger people getting into it. There is a rising “connoisseur-ship” that’s evolved in the world of vaping in which vapers discuss vaping in the same way that wine aficionados discuss the nuances of whatever wine they are drinking. That’s great, but that doesn’t lessen the dangers outlined above. Are vapers listening? Not really. In 2013, e-cigarette-related sales were $1.7 billion, which was double what they were in 2012. In 2015, those sales had risen to $2.9 billion. Many tobacco manufacturers also are in the e-cigarette game. More than 250 e-cig brands are on the market. Perhaps this Surgeon General’s report will help refocus attention on the dangers of e-cigarettes and give people enough of a reason to take a pass at the growing trend of vaping. Although smoking trends among youth have shifted in recent years from tobacco cigarettes to e-cigarettes, the highly addictive culprit nicotine remains constant, a fact that should be underscored in discussion of risk with youth and their parents. “I think most people realize nicotine is addictive, but I don’t know if there’s an understanding of just how addictive it is – particularly for youths,” said Lorena M. Siqueira, MD, MSPH, lead author of a new report on nicotine, addiction, and youth that was released by the American Academy of Pediatrics (AAP). “People think, for instance, only having a few cigarettes a week may be fine and they can quit any time, but they don’t realize that they are already well on their way to dependency,” Dr Siqueira, a member of the AAP Committee on Substance Use and Prevention, told Medscape Medical News. The report was published in the January issue of Pediatrics. Evidence shows that the earlier in life a person is exposed to nicotine, the less likely they will be able to quit using tobacco and the more likely they will consume increasingly greater quantities. The vast majority of tobacco-dependent adults – up to 90% – started smoking before age 18 years. The authors also point out that the earlier a child starts smoking, the greater the risk of continuing to smoke in adulthood. Approximately two thirds of children who smoke in sixth grade, for example, become regular smokers as adults. In comparison, 46% of youth who begin smoking in the eleventh grade go on to become regular smokers as adults. In addition, compared to adult smokers, youths require more attempts to quit smoking before being successful. In addition, only about 4% of smokers aged 12 to 19 years have been shown to successfully quit each year, the authors report. Although e-cigarettes are marketed as a tool for smoking cessation, there is no strong evidence to support these claims, the authors note. In fact, research, including a study published in JAMA Pediatrics in 2014, indicates that e-cigarettes, which contain nicotine, encourage, rather than discourage, tobacco use in youth. Since that study’s publication, a number of other studies have shown similar harms, the study’s coauthor, Stanton A. Glantz, PhD, of the Center for Tobacco Research and Education at the University of California, San Francisco, told Medscape Medical News. “There are now seven published longitudinal studies showing that youths who initiate smoking with e-cigarettes are about three times more likely to be smoking conventional cigarettes a year later,” he said. Instead of making quitting easier, e-cigarettes make it harder, Dr Glantz added. Among key attractions to e-cigarettes – and arguments that adolescents are likely to raise with parents ― is the idea that at least they are not as harmful as tobacco, Dr Siqueira said. “It’s not unlike the prescription drug epidemic – adolescents think, ‘If my grandmother takes it, then it must be safe,’ so this is sort of the same thing,” she said. The report also notes that e-cigarettes are not without toxic hazards of their own. Accidental poisonings associated with e-cigarette use have increased from one per month in 2010 to 215 per month in 2014, including one death. “The take-home message is that there’s no arguing that nicotine is highly addictive, and it’s not just in cigarettes but it’s in all of these other products that are being cleverly marketed to youths to include ingredients and flavors to increase the palatability,” she said. A new report from the University of Michigan’s Monitoring the Future study shows some encouraging trends regarding e-cigarettes. According to the study, after gaining popularity earlier in the decade, the percentage of US teens who use e-cigarettes declined for the first time from 2015 to 2016. The percentage of adolescents who used e-cigarettes in the past 30 days declined from 16% to 13% for 12th graders, from 14% to 11% for 10th graders, and from 8% to 6% among 8th graders; each change was statistically significant. The report had even more encouraging news for cigarette smoking. The levels of smoking among 8th-, 10th-, and 12th-grade teens are the lowest they have been since annual tracking began 42 years ago. “Since the peak year in 1997, the proportion of students currently smoking has dropped by more than three quarters — an extremely important development for the health and longevity of this generation of Americans,” principal investigator Lloyd Johnston, PhD, University of Michigan, Ann Arbor, said in a release. The authors have disclosed no relevant financial relationshps. Dr Glantz has received research funding from the National Institutes of Health and from the Truth Initiative, a tobacco use prevention nonprofit organization. UK public health experts have moved to quash fears about the potential dangers of e-cigarettes in the wake of the US Surgeon General’s report* setting out the urgent need to curb the rising popularity of vaping among young people in the US. Clinicians should not be put off from helping smokers to quit or cut their risk of harm by switching to vaping, they insist. In his report,* published earlier this week, Dr Vivek Murthy pointed to the evidence on the impact of nicotine on the developing brain, and its ability to trigger lifelong addiction, as well as the potentially harmful additives found in some e-cigarettes. Use of e-cigarettes among high school students in the US had soared by 900% in the past five years, surpassing all other forms of conventional tobacco use, he said. “We must protect our nation’s young people from a lifetime of nicotine addiction and associated problems by immediately addressing e-cigarettes as an urgent public health problem. Now is the time to take action,” he urged. But Professor Kevin Fenton, national director of health and wellbeing at Public Health England, said that while he understood the concern about the rapid uptake of e-cigarettes in the US, attempts to regulate these products in the US had been difficult, and the situation in the UK was very different. “We have comprehensive regulations in place, including a ban on selling e-cigarettes to under-18s and tough restrictions on advertising, as well as minimum standards for safety, maximum nicotine levels and health warnings on packs,” he said. “Our review of the evidence found e-cigarette use carries a fraction of the risk of smoking, a conclusion reiterated by the Royal College of Physicians earlier this year. No new evidence has been published to contradict this, however we are closely monitoring any emerging evidence,” he added. Professor Peter Hajek, Director of the Tobacco Dependence Research Unit at Queen Mary University of London (QMUL), reiterated the findings of the Royal College of Physicians report, which identified vaping “as a great public health opportunity,” rather than a threat. “The new US report’s conclusions do not tally with what the actual data show. It is simply not true that e-cigarettes are a tobacco product or that vaping lures children to smoking or that it creates dependence in non-smokers,” he insisted. “The prevalence of smoking among young people is at an all-time low and regular use of nicotine containing e-cigarettes among never-smokers is extremely rare. Ongoing vigilance is needed, but so far, e-cigarettes have acted as a gateway away from smoking, for adults and adolescents alike,” he continued. The report also ignores the huge benefits of vaping for adult smokers in helping them switch from “deadly smoking,” he added. “The worst part of the report is its policy recommendations. They may be well meant, but no consideration is given to their likely unintended consequences. Limiting smokers’ access to the much less risky option of vaping is likely to contribute to keeping smokers smoking and smoking-related disease and death going at the current rate,” he said. Linda Bauld, Professor of Health Policy at the University of Stirling and Co-Chair of the Smoking in Pregnancy Challenge Group, said the evidence presented in the report on the potential harms of vaping during pregnancy had been fundamentally misunderstood, and was based on studies in rats and mice, not people. “While we need more research on e-cigarettes, pregnant women who find it difficult to stop smoking should not be discouraged from using them. This is the position and current advice in the UK endorsed by a range of organisations,” she pointed out. The Surgeon General’s report might make clinicians more hesitant about discussing e-cigarettes with pregnant women who smoke. “That would be harmful to maternal and child health and must be avoided,” she insisted. A positive if unintended result of the e-cigarette controversy is that highlighting the relative dangers of tobacco cigarettes and e-cigarettes further deglamorizes them both. The discussion presents the public with the unpleasant truth that nicotine isn’t a recreational drug. Addiction to nicotine in tobacco is the norm, not the exception, and smoking addiction is about compulsive behavior and suffering, not pleasure. All the current studies show that people who quit smoking enjoy improved mental health, more positive moods and better quality of life than those who continue to smoke. Nicotine replacement comes in many forms, including e-cigarettes. It can help ease smokers out of smoking, but only if they stop completely. The case for e-cigarettes would be stronger if the United States, like the British National Health Service, offered clinical assistance to help addicted smokers quit, rather than just relying on our culture of self-help. The writer, a clinical psychologist, is director of smoking cessation services at Columbia University. E-cigarettes are not the panacea to tobacco-caused addiction, death and disease. E-cigarettes are unregulated tobacco products, and e-cigarette companies are making unproven health claims. The Food and Drug Administration has not found any e-cigarette to be safe and effective in helping smokers quit. Instead, almost 60 percent of all e-cigarette users continue to smoke cigarettes. Tobacco use is the leading cause of preventable death and disease in our country, and there is real concern that if e-cigarettes delay or prevent smoking cessation, the overall burden on health caused by tobacco will remain unacceptably high. In 2009, a bipartisan majority in Congress charged the F.D.A. with oversight over tobacco products, including new products. The agency has taken steps to use this authority, and it should proceed with its process that allows manufacturers to provide evidence to show that their products are less harmful. Trusting the tobacco industry and circumventing robust scientific review and oversight of these products would be a mistake. National President and Chief Exec.